MINIATURE CHINA BOWL. This Bowl does not have a maker's mark. SCALE DEPENDS UPON APPLICATION. We'll keep a light in the window and the coffee pot on! If your login attempts are unsuccessful you'll be automatically redirected to a secure page where you can enter your credit card information. Perfect size for a barbie doll size doll. From a clean and smoke free estate collection. Great addition to any collection, 2 sets of Salt & Pepper Shakers, Pitchers and more. It features a Cherry blossom patter on a cream with gold accents around the rims. There is no makers marks on the pieces. 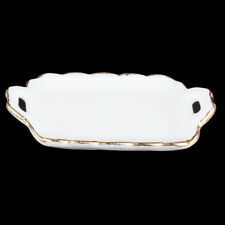 Serving Platters: 3/18" long and2 1/8" wide. There are surface scratches and scuffs to the pieces. Material : Ceramic. We will reply within 24 hours. - If you are not satisfied with it. 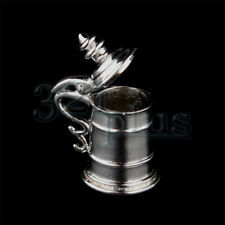 This very detailed and authentic looking beer mug can be placed in a miniature living room or mini dining room scenery. These shining miniature beer mugs also have a beautiful handle on them which would make it for your miniature people easier to get hold on your beer mugs. The smartly attained shape of this miniature hot pot can help you change the look of your miniature dollhouse kitchen scenery. With other kitchen miniatures, this miniature cookware will enhance the look of the scenery. 16 Boiled Eggs. Material : Ceramic, Clay. We will reply within 24 hours. - If you are not satisfied with it. This here pictured mini serving dish is made of ceramics is mainly used as miniature house accessories or kitchen cabinet decorations. These 1:6 scale accessories are around 9 mm high. These four pieces of miniature porcelain plates are perfect ceramic miniatures to upgrade your dollhouse kitchen shelves. 3 Canister Jars : Approx 10mm x 10-15mm (Height). 1 Milk Jugs : Approx 15x15 mm. Material : Ceramic. (Option on request). - If you are not satisfied with it. Materials: Porcelain Dimension: Cup Saucer: 23 x 23 mm (0.9" x 0.9") Serving Tray: 32 x 24 mm (1.25" x 0.94") Milk Cup: height 19 mm (0.75") Pot w/Lid: Height 20 mm (0.79") Teapot: Height 28 mm (1.1") Applicable for 1:6 miniature dollhouse, barbie dolls Package Included: 4 cup saucers, 4 cups, 1 serving tray, 1 milk cup,1 pot w/lid, 1 teapot. Note:Please note this item is not full size, it / they are for a dolls house and miniature collectors. Dollhouse dining room silverware for 1:6 scaled dollhouse dining rooms or mini bakery sceneries. 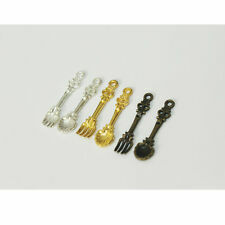 Miniature tableware set which includes a mini fork, a mini knife and a round shaped dollhouse plate in a classy shape. Mini scoop with a height of approx. Silver colored miniature ladle as part of your dollhouse kitchen utensils & collections. This miniature scoop is made for a miniature scenery in the scale of 1:6. Material : Ceramic. Total 16 Pcs. - If you are not satisfied with it. We will reply within 24 hours. Suitable for miniature dollhouse and 1/6 dolls or other similar size dolls. 30 Pieces Dollhouse Plates. - 10 Pieces 3 Sets Multiple Plastic Plates Set Kitchen Tableware Utensils for 1/6 Dolls House Furniture Accessories. This exquisite porcelain tea cup plate set, suits for any style of dollhouse scene. Height of Sugar jar with cover Approx. 1 x Sugar jar with cover lid. Height of Milk Container Approx. Material: Porcelain. 1/6 dollhouse miniature kitchenware chopping board, pretend play cooking tool for dollhouse DIY making accessories. - Perfect and lovely gift for your little girls, kids and dollhouse lovers or collectors. 1 to 6 scaled mini decor item. 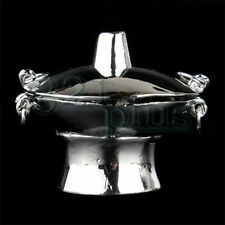 Miniature kitchen supplies in silver. Miniature lemon squeezer which makes a dollhouse kitchen scenery more realistic. The 1 to 6 scale ratio of the piece proves how little it is. This item is 1/6 dollhouse scale, made of glass. Approximate size of glass is 1/2" x 1 1/4", width and height. Materials: Porcelain Features: Red with flower patterns Dimension: Saucer: 23 x 23 mm (0.9" x 0.9") Cup: height 11 mm (0.43") Sugar Cup: Height 18 mm (0.70") Pot w/Lid: Height 20 mm (0.79") Teapot: Height 32 mm (1.25") Applicable to 1:6 dollhouse or Blythe scene Package Included: 6 saucers, 6 cups, 1 sugar cup,1 bowl, 1 pot w/lid, 1 teapot. Note:Please note this item is not full size, it / they are for a dolls house and miniature collectors. It is the best choice for decoration of 1/6 dollhouse. 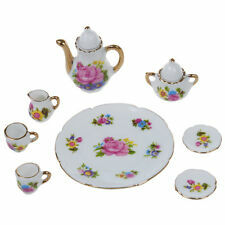 - Rose flowers printed porcelain china tea set pot cup saucer plate 8 pieces set. - Its design is in line with the trend of reality ceramic tea set. 10 Pieces 3 Sets Multiple Plastic Plates Set Kitchen Tableware Utensils for 1/6 Dolls House Furniture Accessories. - Suitable for miniature dollhouse and 1/6 dolls or other similar size dolls. 30 Pieces Dollhouse Plates. Applicable to dollhouse Miniatures or Bjd dolls scene. We are a professional supplier based in China. Materials: Porcelain. Our mission: "Just for a better life". 10 Pieces 3 Sets Multiple Plastic Plates Set Kitchen Tableware Utensils for 1/6 Dolls House Furniture Accessories. 30 Pieces Dollhouse Plates. - Color: Blue, Green, Pink. Due to the light and screen difference, the item's color may be slightly different from the pictures. It is the best choice for decoration of 1/6 dollhouse. 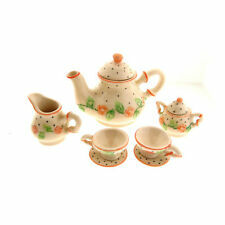 - Its design is in line with the trend of reality ceramic tea set. - Rose flowers printed porcelain china tea set pot cup saucer plate 8 pieces set. Materials: Porcelain Dimension Approx: Dia.4.8cm Applicable to dollhouse Miniatures or Bjd dolls scene Package Included: 2pc x Round dish (other items NOT included) Note:Please note this item is not full size, it / they are for a dolls house and miniature collectors. Convenient creativity for clothes, bags, T-shirts, shirts, blouses, etc. and always need your assistance. Iron on for 10 – 20 seconds. This item is 1/12 dollhouse scale, made of glass. 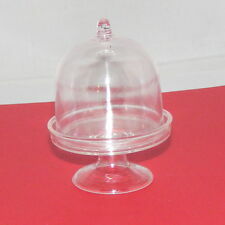 Approximate size of glass is 1/2" x 1 3/4", width and height, lid included. This dollhouse plate for fish is an ideal for dollhouse restaurant scenery accessory. It's silver colored surface an it's very beautiful appearance makes it an ideal choice to serve your long shaped & 1:6 scaled food miniatures. The item(s) is not edible. The main material is plastic. DOLLHOUSE MINIATURE COLLECTIBLE TOY 1: 6 PINK FLOWER PLATE TABLEWARE. Nice Collectible to make your doll house illuminating and lively. 1 Piece of. Mixed lot of Blue Splatterware. 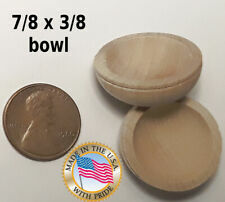 Dollhouse Miniatures 1:12. larger pot with lid. smaller pot with unmatched lid. coffee pot, no lid. small bowl. Applicable for 1:6 dollhouse. We are a professional supplier based in China. Materials: Porcelain. Color: red.